Most people think a barber is just a guy who gives a man a cut and a shave. While that is true for those living in the last two centuries, there was a time when your local barber could give you a cut and a shave and do some bloodletting and that's not because that shave got a little closer to your jugular. In medieval Europe, Barber Surgeons were the most common medical practitioners. After all, they were good with a blade. Bloodletting was a common practice at the time and it was believed that by cutting someone - or in some cases applying leeches - you could cure a myriad of ailments by getting the sick blood out. It was also believed that if all the liquids in the human body were kept in balance, a person would be healthier. Those liquids were blood, yellow bile, black bile and phlegm. Barber Surgeons also extracted teeth, performed surgery, amputated limbs and performed enemas. Most were uneducated and learned their trade as an apprentice. The red, white and blue poles that we identify with barbers today goes back to this time. The colors signify the blood and dressings used by the barbers. The professions of surgeon and barber began to separate as we learned more and surgery became a respected profession. Can you believe there was a time when physicians thought surgery was beneath them? By 1745, the two professions were separated, but barbers did occasionally still perform bloodletting. Going to a barber for surgery, certainly is odd. On this day, August 31st, in 1837, Thomas Edison patented the Kinetoscope. An assistant to Edison had invented a motion picture viewer, but Edison was uninterested in the device considering it a toy. But after some time Edison thought perhaps it could help sell people on his phonograph. So he tried his best to match the sound from the phonograph up to the pictures on the motion picture viewer. He was not successful, but he decided to market the motion picture device anyway and he named it the Kinetoscope, the first ever silent moving picture viewer. Early films were made from an acidic base called nitrate, which caused the films to burn up. This meant that the movies did not last for very long. Luckily, Edison copied some on paper and some of those movies have survived up to our modern era. The Kinetoscope didn't last long though. It could only be viewed by one person at a time, so it was not conducive to showing movies to large groups of people. Thus, the Kinetoscope was soon replaced by the movie projector. Pittsburgh is the original "Gateway to the West" and began as a Frontier Fort. 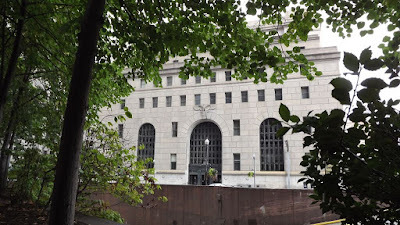 In the 1900s, the Federal Courthouse was built in a design that leaves much to be desired particularly compared to the more interesting Allegheny County Courthouse. But the Federal Courthouse is quite interesting when considering the rumors that it is haunted. Pittsburgh is a very haunted city and this location is just one of the many spots harboring those still here in the afterlife. 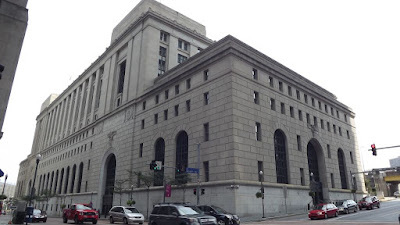 Join us as we explore the history and hauntings of Pittsburgh's Federal Courthouse! Pittsburgh is situated where the Allegheny and the Monongahela Rivers converge and at the head of the Ohio River. For centuries, the area was inhabited by Native American tribes for just that reason. These tribes were numerous and included the Iroquois, Shawnee, Lenape, Seneca, Mohawk, Wyandot and others. The Meadowcroft Rockshelter is considered to be the oldest site of human habitation in North America. When the Europeans arrived, small pox ravaged the area and the tribal populations dwindled to almost nothing. As was the case with many settlements in America, this area was settled by traders initially in 1710. By 1748, the Ohio Company, a land speculation company from Great Britain, acquired acreage in the Upper Ohio Valley. The French were already in nearby Logstown. Tensions would rise between the British and the French over the land. At one point, Major George Washington was sent to warn the French to withdraw. The French and Indian War or Seven Years War started in 1754. The war ended with the signing of the Treaty of Paris and the French Fort Duquesne was razed and Fort Pitt was built in its place. The Fort was named in honor of William Pitt the Elder and that is the inspiration for Pittsburgh's name. The area grew steadily and glass production began. Later, steel would become a part of the industry. Pittsburgh was built on glass and steel and by 1816 it was incorporated. Pittsburgh grew into a commercial and industrial powerhouse. That kind of growth meant that the city needed federal services and buildings. Andrew W. Mellon was the Secretary of the Treasury in the 1930s. He was from Pittsburgh and allocated funds towards the building of a new Federal Courthouse in the city. Trowbridge & Livingston, a New York architectural firm, was hired to design the building. Construction began in 1931, but a strike stopped the work until the following year. The building is in the Stripped Classical style. Most federal buildings in the 20s and 30s were built in this style and the name says it all. These buildings are stripped of anything fancy or ornamental. 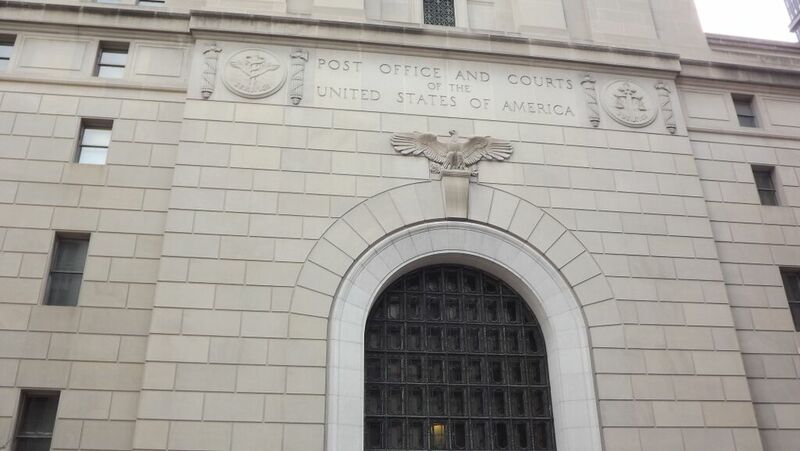 The Federal Courthouse does have two limestone eagles on either side of the entrance. The Stripped Classical style was popular with Fascist and Totalitarian regimes and fell out of favor after World War II. The Federal Building has two distinct areas. The front part of the building is four stories and housed postal facilities and is built from a steel frame covered with granite. The rear area rises to eleven stories and contains courtrooms, jury rooms and other offices and is built from limestone. The building was originally built over the railroad tracks that have since been removed. The tracks helped facilitate the delivery of mail. The interior of the building contains doors and window frames made from bronze and aluminum. The south lobby is covered in Alabama pink granite, the floors are gray marble and the walls are decorated with rope and garland designs. The first floor contains a groin vaulted, terra-cotta ceiling with gold-leaf trim. Groin vaulting is when rounded curves that form a barrel vault come together at right angles. The rest of the courthouse has floors covered in terrazzo and walls of marble wainscot. The building was officially opened in 1934 to fanfare, which was a way for the government to get people excited about the economy and hopeful about the future since the Great Depression was in full swing. Major postal operations were moved to another building in 1983. The building was added to the National Registry of Historic Places in 1995. Extensive renovations and modernizations were done in 2002. One interesting factoid is that the building contained what were referred to as "sneakways" on the postal levels. They were suspended above the floors between the walls and a postal inspector could fit in there and spy on workers through a narrow slit. He would be making sure that no one was opening envelopes or stealing mail. Workers never knew they were being spied upon. Gerald Joseph Weber attended Harvard University and then received his law degree from the University of Pennsylvania Law School. In 1964, President Lynden Johnson nominated Weber as a judge for the United States District Court for the Western District of Pennsylvania. In 1976 he became Chief Judge and served until he went into semi-retirement in 1988. He passed away in 1989 from cancer. Judge Weber was incredibly smart and no nonsense. He loved a cigar and smoked up to six of them a day. And he loved being a judge at the courthouse. Perhaps that is why he has never left. Many claim that his ghost roams the halls to this day. During renovations, contractors repeatedly saw apparitions of Judge Weber walking the fourth floor hallways still wearing his black robes. One worker claimed that the figure asked him, "How's it going?" and then walked away. Later, he recognized the man in a picture on the wall. It was the portrait of Judge Weber. The elevator seems to be haunted by the Judge as well because it will stop on the fourth floor and the doors will open even though no one is inside the elevator. The Judge's courtroom was on the eighth floor though, so is it possible that someone else is here at the courthouse as well? If you ask the cleaning staff, they believe there are several haunts in the place. Much of the cleaning staff have had experiences on several floors including the ninth and first floors and also the fourth floor. One employee has heard her name called out by a disembodied male voice. Doors open and close on their own on the ninth floor and a cleaning lady claims that the spirit of the former director of the U.S. Department of Housing and Urban Development is in the building as well. The building's maintenance inspector has had experiences. The fourth floor is always dark and carries a spooky air to it and he claims that he feels cold drafts on that level all the time. No windows are ever open when this happens, but it is an older building. The basement creeps everyone out with its strange passageways and massive pipes snaking about the entire area. One judge did indeed die in the Federal Courthouse. Judge John McIlvaine had a heart attack in 1963 and died on a couch outside the courtroom on the sixth floor. Is he the one that the cleaning people sometimes feel swish by them? The Federal Courthouse is your typical federal building in a typical large city. The idea that it may harbor some sticking around in the afterlife does make it unique. Is it possible that disembodied judges still roam the hallways? 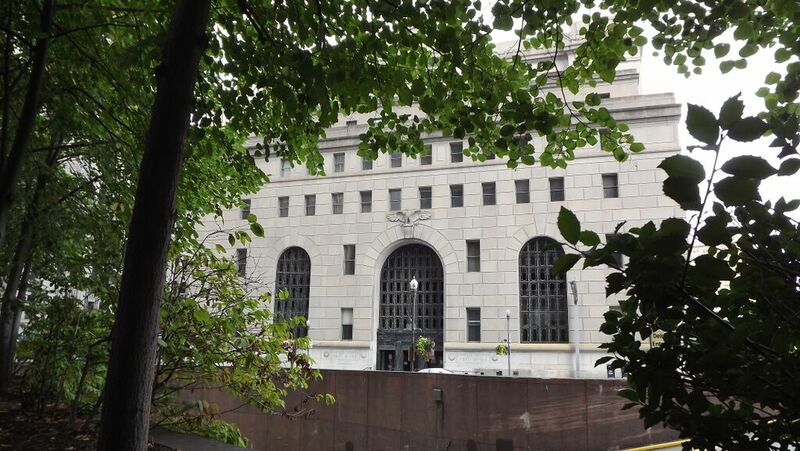 Is Pittsburgh's Federal Courthouse haunted? That is for you to decide! There is a very eerie mannequin in the store window at a bridal shop located in Chihuahua, Mexico. La Pascualita, as the mannequin is called, was installed in the window at La Casa de Pascualita in 1930. She is so life-like that legend claims she is a real woman who has been perfectly embalmed. Even more curious is that the owner in 1930, Pascuala Esparza, had a daughter who had died on her wedding day after being bitten by a black widow spider. The mannequin bares an uncanny resemblance to Esparza. It is not only the face of La Pascualita that seems so life-like. Her hands are so detailed that they look just as human as my hands. And her legs even have varicose veins. People who come into the shop claim that her eyes follow them as they move around the store and employees think she moves at night. An employee who has to change the mannequin's clothes says she gets very nervous when she has to do it because La Pascualita seems so real. Some have dubbed her the Corpse Bride. One legend claims a magician would come and bring her to life at night and take her out on the town. She more than likely is the work of a very talented sculptor who captured the likeness of the previous store owner, but just like a doll, she sure gives us the heebee jeebees because she is so odd. On this day, August 24th, in 79 AD, the most catastrophic eruption of a volcano occurred. Near the ancient city of Pompeii in Italy was located a volcano named Mount Vesuvius. Pliny theYounger, who was a Roman poet, gave an eyewitness description of the destruction wreaked when Mt. Vesuvius literally blew its top. For several years, violent earthquakes had rocked the area giving early indications that all was not well with the volcano. On the morning of August 24th, ash and smoke began to spew from the volcano. At 1pm, Vesuvius erupted throwing ash across the region, blanketing everything. Then a quick moving deadly flow of lava that was intensely hot began rushing forward, knocking down every building in its path. The eruption lasted for two days. It is believed that 1500 people died during the eruption. Modern day research and study of the cities of Pompeii and Herculaneum, which were completely destroyed, reveals that many of the people were killed by falling roofs and debris, rather than from the ash. Some people were encased in ash though and their bodies were slightly preserved because of this. Many were killed in a fraction of a second. The blast was a hundred thousand times the thermal energy of the Hiroshima bombing. Proving that even man cannot create something as powerful as what nature can create. Being born into poverty does not usually relegate someone into a life of opulence and superstardom; a fame so great that everyone knows the person by just one name. Such was the life of Elvis Presley. It was a life cut short 38 years ago this month, but the legacy of Elvis lives on whether it be his influence on music, style or entertainment. After his death, it was popular for there to be sightings of Elvis. Some thought he faked his death so he could live a normal life. While many sightings have been of fully alive people who happened to look like the man dubbed "The King of Rock and Roll," other sightings have been of a ghostly image of Elvis. On this episode, we explore the life and afterlife of Elvis Presley. Elvis Aaron Presley was born on January 8, 1935 along with his twin Jessie Garon to Gladys and Vernon Presley in Tupelo, Mississippi. Jessie was stillborn and Elvis would feel the pain of that loss his entire life. Vernon had built a small two room shotgun style house before the twins were born and Elvis entered life in that house. Vernon and Gladys were poor and Vernon had a hard time finding work. In 1938, the Presleys would lose their house and Vernon went to jail for eight months for check fraud. Gladys and Elvis would form a very close co-dependent bond and she would come to rely on Elvis more than Vernon. The Presleys attended church and Elvis started his love of music there. Elvis' first public performance was at the age of ten. He dressed up like a cowboy and sang "Old Shep" at a contest. He took fifth place, but his parents soon bought him a guitar and encouraged him to continue with music. Elvis enjoyed listening to Mississippi Slim's radio show and picked up his hillbilly rock sound from that while also being inspired by the spirituals he heard sung in his mostly black neighborhood. Mississippi Slim taught Elvis how to play chords on his guitar and even let him sing on-air. Elvis was a loner and painfully shy. He got stage fright and was unable to sing the first time he was invited on the radio, but he was able to sing the next time. In 1948, the Presleys moved into public housing apartments in Memphis, Tennessee. Elvis entered high school in Memphis and had a music teacher that thought he had no talent and disliked the music Elvis performed. Elvis was also bullied as a mama's boy because he was so close to his mother. Vernon continued to be a never-do-well in Memphis. In 1950, Elvis started singing with a group of boys performing rockabilly. At this same time, Elvis blossomed into his own unique self that would cause him to standout for the rest of his life. He grew his sideburns long, styled his hair with vaseline and started wearing wild stylish clothes he purchased with his own money he earned working odd jobs. In 1953, he took to the stage at a talent show and he soon found himself popular in school based on his performance. Elvis decided that music would be his life. In 1954, Elvis headed down to Sun Records to record a present for his mother. He wanted to make her a record. He performed "My Happiness" and "That's When Your Heartaches Begin." Elvis told the receptionist at Sun Records that he didn't sound like anybody else and he was right. Sam Philips was the owner of Sun Records and he took note of Elvis' name, but was not initially interested in his singing. Most people in the music industry did not appreciate Elvis' talents. He was told by one man to stick to truck driving because he would never make it as a singer. Philips had long been seeking someone that had the sound of the black soul singers, but was a white man. He thought Elvis might just be that person. He asked two local musicians, bassist Bill Black and guitarist Scotty Moore, to play on a record with Elvis. The trio worked for hours to develop something to no avail. They were about to give up when Elvis started strumming his guitar and singing "That's Alright Mama." Philips knew that was the sound he wanted and he recorded the trio's first record. Philips took the record to a local DJ and people went nuts for the song. Callers phoned in all night asking who the singer was and the DJ ended up playing the song on a continuous loop for the last two hours of his show. And the legend that would become the "King of Rock and Roll" was begun. The next day, the trio recorded "Blue Moon of Kentucky" and it became the B side of "That's Alright Mama." The group began performing locally and Elvis found that his stage fright caused his legs to shake. He would move his legs to try to hide his nerves and the cut of his pants emphasized the movement. Girls started to notice. Elvis realized that the movements got positive reactions, so he went with it and his bassist Black would follow suit, riding his bass and beating on it with what Elvis' called a jungle drum sound. The trio continued to record and play clubs and finally made it to the Grand Ole Opry stage. It would be Elvis' only performance there as the manager felt he did not suit the venue. Elvis had been playing the same guitar he had received as a child this whole time. He finally purchased a new Martin guitar after the group was booked for the Louisiana Hayride for repeated performances on Saturdays. Elvis was moving up in music, but his mother was not happy. She continuously worried about him and guilted him for being away. In 1955, Elvis met Colonel Tom Parker who was a promoter. He took Elvis under his wing and began booking him. Elvis found himself in a weird predicament at this time when it came to his music. One could say he was the first crossover artists. Radio stations did not know what genre his music was and the records had a hard time finding airtime. Some said they were blues, some said jazz and others said country. His songs were actually a mix of all of them and this sound became known as rockabilly. D.J. Fontana joined the trio as a drummer and they began playing in shows with Bill Haley and the Comets. Parker got Elvis signed to RCA Records. They reissued his Sun Recordings and he began singing new songs under the label. In January of 1956, Elvis recorded "Heartbreak Hotel" for RCA. Colonel Parker took on the role as Elvis' manager at this time as well. Elvis' debut album with RCA was the first rock and roll album to ever top the Billboard charts. Elvis made two appearances on the Milton Berle Show with the second appearance causing a huge firestorm across America because of his exaggerated gyrations. The Steve Allen Show forced Elvis to stand still, dress in a tux and sing "Hound Dog" to a basset hound. Elvis made the best of it and played it like comedy, but he always felt it was his most ridiculous performance. Paramount Pictures signed Elvis to a seven year contract at this time and it was an open contract that allowed him to work for other studios. Elvis would make 31 films in his career and not be happy with most of the roles he played. He loved watching movies and he desired to be like James Dean. He wanted gritty roles, but most movies would basically showcase his singing talent. His debut film "Love Me Tender" did well and probably came closest to giving him the kind of role he wanted. Jailhouse Rock was one of his grittier roles as well and Diane's favorite Elvis movie. Elvis continued to perform live and his concerts became near riots with girls screaming and passing out the minute he would step on stage. His records continued to hit number one and in 1957 he was able to purchase his beloved Graceland, an 18 room mansion in Memphis. He moved both of his parents into the home with him. Elvis was drafted the following year and entered the Army believing that his singing career would be over. He managed to record some songs when he was on leave and as we all know, his career was anything but finished. Two major life events happened during his tour of duty. The first was the loss of his mother who died at only 46 from heart failure. She had been suffering from hepatitis previous to this. Elvis was devastated. The relationship they shared was strange and she was probably the only woman Elvis ever truly loved. The second life event was that he met Priscilla Beaulieu while he was serving in Germany. Priscilla was only 14-years-old when she met Elvis at a party at his place in Germany. They dated while he was stationed there and when he returned to America, she thought the romance was over. By March of 1963, Priscilla was moved into Graceland despite being underaged. Her parents agreed to the arrangement as long as Elvis promised to marry her and as long as she attended an all girls Catholic school. Priscilla was left at Graceland while Elvis went to Hollywood to make movies and he carried on multiple affairs with his co-stars. He did eventually marry Priscilla in 1967 and she would give birth to Elvis' only child, Lisa Marie. Elvis' abuse of amphetamines began while he was in the Army and he would abuse prescription drugs for the rest of his life believing they helped him perform and helped to keep the weight off. He got Priscilla started on them as well. Their marriage was doomed from the beginning. Elvis had never wanted to marry and his fame and the Memphis Mafia, which was his close circle of friends and body guards, kept Elvis distant from Priscilla. And then there was Colonel Parker. While he helped Elvis attain much of the fame and success he had due to his management, he also pushed people away from Elvis and helped to keep him drug addicted. The hits still kept coming from Elvis despite his home troubles. Nobody has touched the heights Elvis reached except for The Beatles. He and Priscilla separated in 1972 and were divorced the next year. Despite the divorce, Priscilla founded and ran Elvis Presley Enterprises in order to protect Lisa Marie's inheritance, but she also remained close with Elvis, holding his hand as they left the courthouse. Priscilla would turn the meager $1 million inheritance to $100 million with her business prowess. Elvis continued to star in movies that were panned by critics, but commercial successes. During his marriage to Priscilla, the songs that Elvis recorded steadily sank on the charts. The number one spot alluded him for five years, save for one song, "Crying in the Chapel." He decided to perform in a television special that was dubbed, "The '68 Comeback Special." Elvis wore black leather and performed before an intimate crowd in a mainly acoustic style. It was a huge success. He fell in love with music again. He started performing in concerts again and wearing the elaborate jumpsuits that we all know him by today. Elvis became a mainstay in Vegas in these later years and requests came in from around the world for him to perform. Newsweek proclaimed of Elvis, "There are several unbelievable things about Elvis, but the most incredible is his staying power in a world where meteoric careers fade like shooting stars." The schedule Elvis kept was grueling. He ate poorly and fueled his energy with prescription drugs. Elvis never thought of himself as an addict, but he was as addicted as any skidrow junkie and it would kill him eventually. His health began to fade quickly. In 1973, he overdosed on barbituates twice. This didn't stop him from running with an equally crazy concert tour in 1974. His bandmates really feared for his life and watched as he used the microphone stand to hold himself up and slurred through songs that were barely intelligible. Elvis continued to record a few songs in the 70s, but his last albums were basically live recordings of his concerts. RCA set up a studio for him at Graceland, but Elvis was unable to record. He could barely perform live at this point. By early 1977, he was giving very short concerts, barely staying on stage for an hour, or just not showing up for concerts altogether. His concert tour was cancelled. On August 16, 1977, Elvis went into his bathroom and he did not come out. His girlfriend, Ginger Alden, found him unresponsive on the floor and called 911. 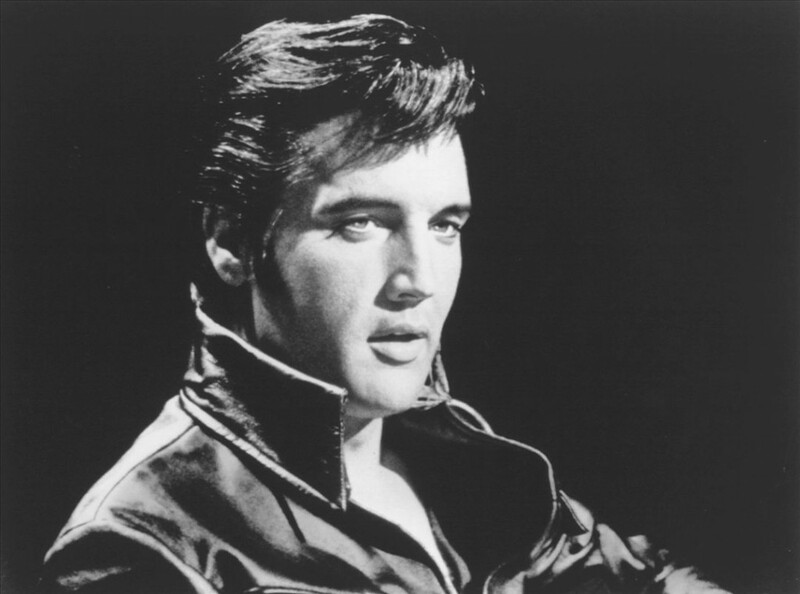 Elvis Presley was pronounced dead at 3:30pm at Baptist Memorial Hospital. Years of drug use had taken their toll. 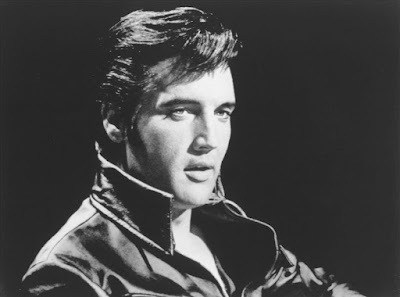 Elvis' had genetic heart disease and the drugs probably hastened his death. But some refuse to believe that Elvis is dead. To this day, people still claim to catch sightings of him. In 1998, a man by the name of Jimmy Ellis was murdered in a pawn shop he owned in Alabama. Jimmy had a music career at one time. He went by the stage name Orion and he wore a mask like Zorro. He gained some fame, not because of his talent, but because he looked and sounded just like Elvis. People began to believe he was Elvis. A new documentary entitled "Orion: The Man Who Would Be King" details his struggle to get out from Elvis' shadow. The world wanted Elvis back and that desire led many to believe Ellis was the King. Other sightings happened as well. But the sightings we are interested in are the sightings of Elvis in the afterlife. As is the case with many haunted people we have featured on the podcast, Elvis' spirit is seen and felt at many locations. But his favorite place is still Graceland. Many fans have snapped photos of Graceland and captured what looks like the spirit of Elvis peering out from windows. His grave is behind Graceland and his full bodied apparition has been seen standing near the grave. He has also been spotted going up and down the stairs inside his home. Tour guides have been asked by visitors who the man impersonating Elvis is, but the tours do not feature Elvis impersonators. The sound of a male singing upstairs at Graceland has been heard. On one particular tour, several people claimed that Elvis had appeared to them and asked what they were doing in his house. Then it happened again and again over several days. At least nine people claimed to have the same experience of a young Elvis asking them the question about being in his home. It was in 1980, on December 20th, that Elvis was picked up by five separate people in their cars. He was wearing an Army uniform and was young. He asked the drivers to stop at the gates of Graceland. One of the drivers was driving a truck and he claimed that the young Elvis sang for him while they drove. There are others who have seen Elvis dressed in a uniform near Graceland on other days as well. Wayne Newton claims to have seen the ghost of Elvis once when he was performing. He said that it happened when he was on stage playing a set and the lights went very dark and everything in the room seemed to stop. He looked up at the balcony, which was suppose to be empty and saw a man standing there. There suddenly was a light behind the man and there was no doubt in Wayne Newton's mind that the figure was Elvis in a jumpsuit. Then he saw his face and Elvis was smiling at him as though he approved of the performance. Then he disappeared, the lights came back up again and the room was full of the sounds of the performance. The Las Vegas Hilton was a favorite place for Elvis to perform and he seems to be hanging out in the afterlife. His apparition has been seen wearing his traditional rhinestone jumpsuit hurrying in the direction of the stage. When people attempt to interact with the apparition, it disappears. Most interesting is that a ghostly Cadillac joins Elvis at the Hilton. Elvis used to have his own private entrance into the hotel. A concrete wall now stands where that entrance once had been. Witnesses claim to see a man who looks like Elvis driving a red Cadillac around the Hilton and that when he arrives at the concrete wall, he and the car go right through as if the private entrance was still there. Elvis lived bigger than life. Is it possible for a life like that just to end? Is it just the legend of Elvis that lives on or does he continue on in the afterlife? Are people truly seeing the ghost of Elvis? That is for you to decide! Is it possible for a river to be underwater? We don't mean a river OF water, but a river UNDER water. In October of 2014, photographer Anatoly Beloshchin decided to do some diving photography in the Yucatan of Mexico. He went diving in a swimming hole named Angelita. When he had reached 100 feet below the surface he discovered something shocking. There was another habitat beneath the swimming hole containing a river. 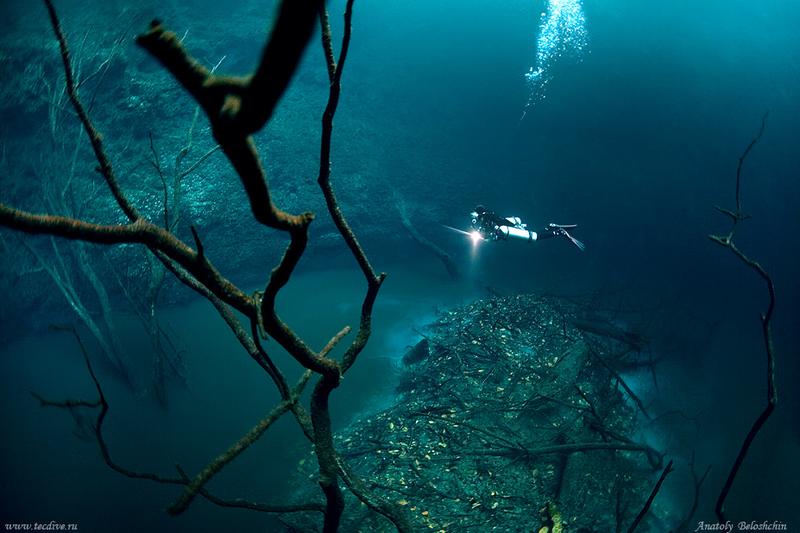 Pictures clearly show a distinct river and one would not realize that it was underwater if not for the fact that a diver is in the picture with bubbles flowing from his tanks. It just looks like a river being photographed at night. 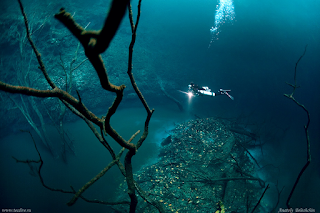 Such a strange phenomenon is known as a cenote and results from the collapse of a sinkhole. This collapse exposes groundwater underneath and the sinkhole fills with fresh rain water. Vast underwater caves result. Because of the difference in freshwater from rain and saltwater from groundwater, the two water formations appear separate. The only evidence of the waters being together is the point where they converge or mix. This mixture causes a milky effect called halocline. It's a beautiful site to behold, but also quite odd. On this day, August 17th, in 1859, the first air mail made its way across America. Now most people might be scratching their heads because the Wright Brothers didn't get a plane off the ground until 1903, so how did air mail start in America in 1859. It travelled by balloon of course! 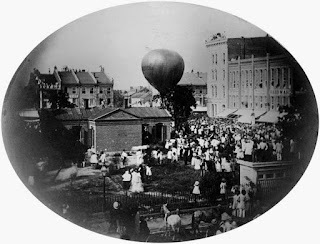 August 17th was a very hot day as John Wise boarded his balloon named Jupiter. The postmaster had given him a bag full of 123 letters that needed to be delivered to New York City. The balloon Jupiter launched from Lafayette, Indiana. This big moment in history would not end in complete success. The weather turned nasty and Wise found it hard to navigate against the wind. He finally gave up and landed in Crawfordsville, Indiana. The mail was put on a train to complete its delivery. But in the end, it did travel part way via air for the first time in America. Moses Cone Manor is also known as Flat Top Manor and is located in the Blue Ridge National Heritage Area in North Carolina. It is a beautiful mansion built by Moses Cone at the turn of the last century. Cone loved the home and some wonder if perhaps he is still there in the afterlife. The tales that surround the manor include tales of moving furniture, ominous noises, strange happenings and even grave robbing. 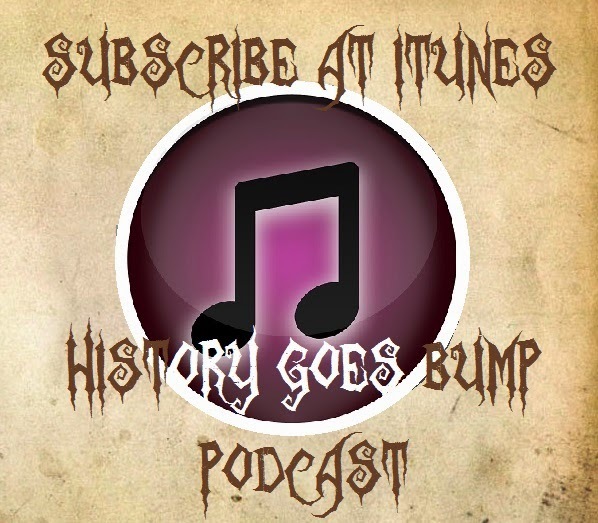 Our listener and North Carolina resident, Steven Pappas joins us as a special guest host as we share the history and hauntings of the Moses Cone Manor. Moses Cone was born on June 29th in 1857 in Jonesboro, Tennessee. He was born into a German Jewish family. Both of his parents were born in Germany and immigrated with their families to America where they met and married. Moses was the eldest of thirteen children. Cone's father became a successful grocer and moved his family to Baltimore, Maryland where his success expanded. Moses and his brother Ceasar became traveling salesmen for the business. Moses learned much about business from his father. He became a successful entrepreneur in the textile business. He met a girl named Bertha and it took him four years to convince her to marry him. Moses convinced his brother to join him in investing in some southern textile mills. Those mills specialized in a textile that was perfect for blue collar workers: denim. By the late nineteenth century, Moses was known as the "Denim King." He opened a firm in Greensboro, North Carolina and entered into a busuiness relationship with the Levi Strauss Company that continues to this day. Life was good for Moses, but he did not live a long life. He died at 51 in 1908 from a pulmonary edema. Seven years before his death, Moses built Flat Top Manor. 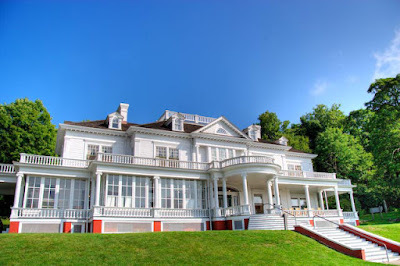 Moses began buying up land in Blowing Rock, North Carolina in the 1890s and part of that land included Flat Toop Mountain for which the manor was named. The home was built in the Colonial Revivalist style and cost $25,000 to build. The house features large white columns and leaded glass windows. Amenities included gas lighting and central heating and there was also a telephone. The house had twenty-three rooms and included 13,000 square feet of living space. Horse drawn wagons had to bring in all the construction material and furnishings. There were several out-buildings that included employee housing, a washing house and a single lane bowling alley. Moses had wanted to be buried on the property and he picked the spot several years before his death. Rumors circulated after Moses' death that he had been buried with a treasure of jewels. So one night, some grave robbers came and dug up his grave in hopes of finding the treasure. All they found was the corpse of Moses Cone. Out of frustration, they propped the body up against his tombstone, rather than burying him again. His poor wife Bertha is the one who found him. No one is sure whether he was buried in the same spot again or moved to a different location. Separate portraits of Moses and Bertha hung face-to-face on opposite walls for many years. Someone moved the portraits one day to another wall, but not across from each other. The next day, the portraits were found on the floor, leaning against each other. No one could explain how this could have happened. Moses is still on the property in spirit and his apparition has been seen by many people. Steven shared with us some of these experiences. All of them were told by people who did not know each other, but had similar experiences. Steven has been told that they walked up to the grave of Moses Cone there on the property without a flashlight to try and see something. All of these people claim the same thing. They all claim a man dressed in "old-timey" clothes walked up and offered to walk them back down to the manor. Then when they had gotten back, he bid them farewell, walking toward the stables and disappearing right in front of them. Steven also told us about how he and some other guys would bring freshmen up to the property to try and scare the hell out of them. occassionally they saw curtains move. They would make up crazy stories about fake owners and fake deaths to creep out the atmosphere. Once the lights all turned out. Apparently, a timer was connected to the lights, but that didn't stop all of them from running for their lives. They also once found an old pair of shoes from a by gone era sitting on the porch. Steven told us about the experience a crafter who stayed overnight had in the manor. The bedroom door opened in the middle of the night, waking him from slumber. He checked to see if a draft had opened the door, but there was none. He closed the door and went back to bed. A little later, the door opened again. He checked to make sure that everything was level and closed the door again. Some time later it opened a third time and this time he shoved a chair under the doorknob. When he awakened in the morning, the door was wide open and the chair was sitting in the opposite corner. Other crafters have stayed overnight when the weather is bad and they have heard furniture moving around on the second floor even though nothing is on that floor anymore. Another woman was staying overnight alone and she thought the talk of ghosts was ridiculous. She took a hot shower and became a believer when she saw a hand print in the steam on the window. She never came back to the manor. Disembodied music has been heard tinkling inside the manor although no piano exists. Steven told us that the Cones were lovers of music and played often. The ghost of a little girl has been experienced on the property as well. One night the alarm was tripped, so the park ranger on duty went to investigate. He found nothing, but when he locked the front door, he caught the reflection of a young girl in the window who appeared to be standing behind him. He whirred around and she dashed passed him through the door and she ran up the stairs where she entered another room. he ran after her, thinking she was some kind of lost kid and when he went in the room, he found nothing. She had just disappeared. "While at ASU in the 90s, I went there one day while it was open. I was in a photography class and wanted to photograph the house. I took a friend with me. She always claimed to speak to ghost. She had never been to the housse or heard of it. First thing she said before walking in was "there's something upstairs." I asked her what. She said a little girl. Then she said there was another, and older woman. Then she said, "Let's go!" and was out the door. She said the third thing scared her." The Moses Cone Manor is a magnificient structure. Does it hold more than just the memories of the couple who once lived there? Are Bertha and Moses still living in their home in the afterlife? Is something else in residence at the home? Are these weird activities just figments of the imagination? Is Moses Cone Manor haunted? That is for you to decide? Want To Be An Executive Producer Of The Podcast? 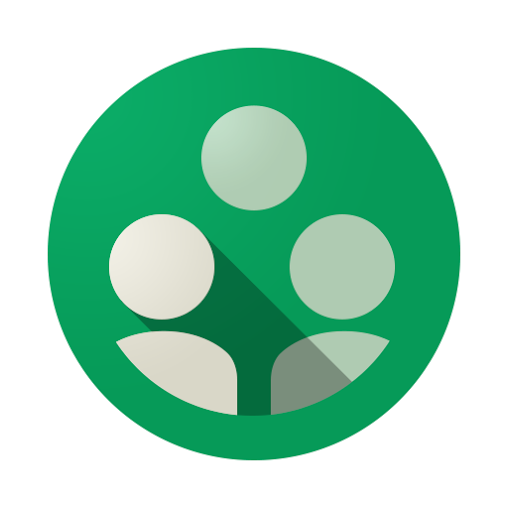 We have updated our Patreon page and support page to reflect changes we have made in regards to financial donors. We consider these people to be Executive Producers of the show because they are financially backing it. These people will now be credited on the podcasts as such and on our support page. This is the real deal, so add it to resumes: Executive Producer of the History Goes Bump Podcast. If you give monthly as a recurring donation, we will credit you on each podcast for each month you donate. If you give us a one-time donation, you will be credited on each podcast for one month. Listeners may have noticed this month, August 2015, that we have only been posting a podcast once a week, rather than our regular every 5 days and sometimes more often. We have pulled back on production because the show is not only still not covering its monthly expenses, but of the $771.82 expenses we have racked up in our first 10 months of production (equipment, programs, voiceovers and monthly hosting for the podcast and website), we have only received $300.99 in donations. $200 of which came from Mom and Dad (does that count?) which helped us to host two contests. So that leaves us $470.83 still in the hole and we are $3 short each month of covering our hosting expenses for the podcast and website. Most podcasts do not produce the amount of content we were without having a bunch of monetary support - the host of Lore announced on his last podcast that despite lots of requests for more than 20 minutes every 2 weeks, he wouldn't do more until he was making enough to do it full-time. And that's with him having sponsorships. We are commited to making this our collective show rather than some affiliate or company's show. Even $1 makes a difference! Just want to be completely transparent with our great community of listeners and keep you in the loop since we know some people were wondering! Click here to become an Executive Producer! The Palm Sunday Case is an unusual study in life after death. Mary Catherine Lyttleton was a beautiful young lady who caught the eye of Arthur James Balfour. It took some time, but the smitten Balfour eventually convinced Mary to marry him. Unfortunately, Mary caught typhus and died a few weeks after their engagement on Palm Sunday in 1875. Baldour was devastated and never married. In the early 1900s, several mediums began receiving messages through automatic writing that pertained to Mary Lyttleton and a brother of Arthur Balfour who had died in the Alps. These messages became long scripts. The mediums did not know these people, nor the story about Balfour and Lyttleton. They managed to find Balfour and one of the mediums revealed to him that Mary was trying to contact him to let him know that she still loved him in the afterlife. Balfour did not believe the medium at first, but after many sessions which revealed things the woman could not have known, he became convinced and died having experienced great peace and comfort. The details of the Palm Sunday Case were not revealed until 1960 and they are compelling because of the symbolism used by those trying to communicate from beyond the veil and because it would seem that several entities were working together to get the attention of the living. The idea that the communication came through automatic writing made it even stranger and the case certainly was odd. On this day, August 10th, the first prize fighting rules were formulated in 1743. Jack Broughton became known as the "Father of English Boxing" and he set some rules to paper that became known as the Broughton Rules. The sport of boxing had been around for over 5000 years, but this was the first time official rules were laid out. Rounds would last as long as it took for one fighter to be knocked down or out of the ring and the fight would end when one of the men was unable to rise after 30 seconds. Knockouts were not the only thing that could end a fight. Capitulation or police intervention could end fights according to the rules. Broughton's Rules lasted until 1839 when the London Prize Ring Rules changed the ring so that it was a 24 square-foot boxing ring with ropes surrounding it. Previously, spectators had formed the ring around the boxers. Many things were forbidden with this boxing. There was no kicking, gouging, biting, head butting and punches below the belt. Many of these rules still stand today and boxing is more popular than ever. Some of the most infamous trials in American history revolve around a small town in Massachusetts named Salem. Salem and witches have become intertwined through the years and a study in human psychology surrounding the events of the Salem Witch Trials reveals a very heinous side to humanity. The use of the terminology "witch hunt" was inspired by the Salem Witch Trials. Today, we explore not only the historic events themselves, but what led several communities to turn on their neighbors leading to deadly results. We also will look at the tales of curses and hauntings that spawned from the Salem Witch Trials. While the Salem Witch Trials are the most famous when it comes to hunting down witches, they were not the first. Thirty years before the trials in Salem, Hartford, Conneticut had its own witch hunt mass hysteria. Eight year old Elizabeth Kelly had died mysteriously after spending time with a neighbor named Goodwife Ayres. Before Elizabeth passed, she told her father that Goodwife was upon her and choking her, leading some to believe the little girl had been possessed by Goodwife. Such possession was termed "bewitchment" at the time. Hartford had some experience with witch hunting being that it was the first town in America to have hung someone for practicing witchcraft in 1647. Four other people were hung shortly thereafter. But it wasn't until Little Elizabeth's death in 1662 that hysteria would manifest for the first time. When all was said and done, there had been seven trials and four people were executed. In 1692, another witch hysteria broke out with no executions, but later in 1697 another hysteria led to eleven executions. So witch hunt hysteria and Puritans seemed to go hand in hand. To understand the thinking of the Puritans, we need to trace back their superstitions to the 14th century. The belief that the Devil would give humans power to harm other humans began in Europe. These beliefs traveled with the Puritans to the New World. Women were also considered weaker and easily tempted into sin. Puritans pointed to Eve for proof and they were fearful of strong willed women. The Puritans had a desire to purify the Church as well and they adopted rigid standards that were outlawed in much of Europe. This is why many moved to New England. Upon getting here, they discovered an unforgiving land where they had to live among people they considered to be savages. Imagine being religious to an extreme and you come to a place where dark skinned people wear little clothing and have what you consider strange practices. And some of these people try to kill you as well. There was culture shock and fear. Sickness also would sweep through towns in the form of plagues and yellow fever. Puritans did not understand medicine and disease and their superstitions led them to attribute all such things to an all powerful Devil. Puritans easily fell into moral panic in which fear of social order breaking down leads to extreme reactions. This is the environment of 1692 Salem. When the young daughter and niece of Salem Village's minister Samuel Parris began having seizures and bizarre fits, the townspeople became worried. A local doctor was called in to diagnose the girls. His conclusion was that the girls had been bewitched. From our modern perspective, it is easy to laugh over such a diagnosis. Surely these girls were experiencing something else. There are many causes for seizures and even some have suggested Ergot poisoning from eating bad Rye bread. Ergot is an ingredient in LSD that helps initiate hallucinations. Even more odd was that five other young girls began exhibiting the same behavior. The girls were gathered together and questioned about who they had been spending their time with. Samuel Parris' Caribbean servant Tituba soon found herself in the center of the storm. Tituba was an Arawak Indian from South America. As a young girl, she had been kidnapped and taken to Barbados where she was sold into slavery. Despite her portrayal as a black woman in most tellings of the narratives around the Salem Witch Trials, the documents from the trials do support an Indian history. It was sometime in Tituba's teens that she came to be a servant for Samuel Parris. No one is sure if he purchased Tituba or if she was given to him to settle a debt. There is speculation that Parris, who was unmarried at the time, may have used Tituba for more than just household chores. Tituba liked to tell stories and she would regale the young girls with strange tales. Perhaps she even taught some of them how to make herbal tinctures. It was something that Tituba did shortly after Parris's daughter went into fits, that thrust her into the spotlight. Tituba used an old practice to see if she could figure out who had bewitched Samuel Parris' daughter. She mixed the young girl's urine with rye and baked a cake called a witchcake. She then fed the cake to a dog. The dog was then suppose to reveal who the person was that had afflicted the daughter. When the Reverend heard about this, he was enraged. Details are murky here. All the young girls claimed that Tituba had bewitched them, but one has to wonder why. Were the girls led to make this accusation by some adults? Did they do this based on the stories that Tituba had told them? Were the girls out to get Tituba? Reverend Parris would later beat Tituba until she confessed she was a witch, which is why we wonder if the girls were not guided in their accusations. Tituba was fearful about what would happen to her and probably believed that if she accused other women, she would somehow take the focus off herself. A homeless woman named Sarah Good and an elderly woman non-churchgoer named Sarah Osborne were accused of practicing witchcraft by Tituba. Tituba claimed that there was a thriving coven in Salem and the Salem Witch Hunt began. By this time, seven young girls were afflicted with contortions, fevers and many complained that it felt like something unseen was biting and pinching them. Two of the girls, Ann Putnam and Mercy Lewis, claimed that they saw witches flying around in the early morning mists. It was easy for the superstitious people of Salem to believe the girls and with Tituba and both Sarahs being outcasts, it was easy to believe that something was evil about them. The trials began for the three accused women and the afflicted girls continued their dramatics in the courtroom. The women were considered guilty and in need of proving their innocence. Tituba, probably out of fear for her life, confessed to all sorts of bizarre things including meeting Satan as both a man and a dog and claiming that she and other women road in the air on poles. Her claims that witchcraft was indeed being practiced fueled the flames. She accused more women of joining her in ceremonies. Soon the zealotry passed to the townspeople. They too began accusing neighbors of witchcraft. Long held bitterness came forward and before long, many innocent people found themselves in jail for witchcraft. Martha Corey, Sarah Cloyce, Mary Easty and Rebecca Nurse were added to the list. And then there was poor Dorcas Good. She was the four-year-old daughter of Sarah Good. She soon was accused of practicing witchcraft and unbelievably, she was thrown in jail for eight months. It was long enough for her to watch her mother be carried off to the gallows. The handful of girls that appeared to be afflicted by the spells of witches continued their dramatics. They twitched during trials and on the streets. They would shout out during church services and complain that the spirits of the witches were attacking them. Ann Putnam's mother even joined in revealing that repressed women can easily fall into hysteria if it means freedom from the constriction of their lives. Unique tests were devised for revealing witches. One such test was used in Boston at the Frog Pond in Boston Commons. If a person floated on top of the water or could survive dunking that held them underwater for several minutes, then that person was deemed a witch. Nevermind that if someone drowned it proved they were not a witch, but they were dead so what would it matter. If you did manage to survive, you would be sent to the gallows. Boston itself hung four people in the Boston Commons. Confessing to being a witch could possibly save your life and many did confess and then pointed fingers at others in order to avoid the gallows. People were checked for witch marks, which were simply birthmarks or moles. 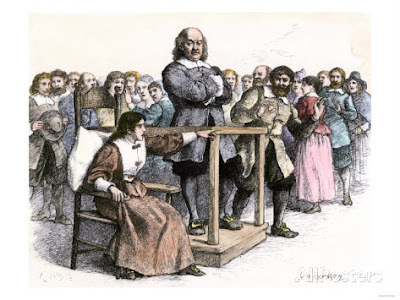 Bridget Bishop was the first to stand trial. On our ghost tour in Salem, we crossed through a parking lot that used to be her apple orchard. She created hard apple cider to serve in her tavern and many believe that her work as a barkeep is what put her under scrutiny. It gave the Puritans a reason to take this woman out. The girls and several neighbors claimed that Bridget's spectre tortured them and that they had seen her turn into a cat. Eight days after she was ruled guilty, Bridget was hung on Gallows Hill. People claim to smell the scent of apples and apple cider in this parking lot. Rebecca Nurse's trial was next. This was an elderly woman who was mostly bedridden and yet the girls accused her of witchery. What some did not know is that Rebecca's family and the Putnams had years of disputes between them, so it's not surprising that she was accused by the Putnams. Rebecca was initially found not guilty, but the main judge sent the jury judges back and they changed their verdict to guilty after several of the girls threw themselves on the ground and convulsed when the not guilty verdict was read. Rebecca was hung with four other women on July 19th. One man from Salem would accuse the townspeople of being silly. John Proctor and his wife were good people and they certainly did not believe that they were surrounded by people who had sold their souls to the Devil. Proctor owned a tavern and denounced the trials regularly. It's not surprising that soon he was accused and then his pregnant wife was accused as well. They were both convicted, but Proctor's wife was not hung so that she could have her baby. She managed to escape execution because she held on until the witch hysteria died down. Proctor however, was hung. Unbelievably, Salem's ex-minister George Burroughs came under fire. He too was found guilty and he refused to confess. He was defiant until the end. After the noose was placed around his neck on Gallows Hill, he recited the Lord's Prayer perfectly. The townspeople were stunned because they believed witches were incapable of reciting the Lord's prayer. Although they were moved, the execution continued at the urging of Judge Cotton Mathers. The story of Giles Corey is horrible. This man was very successful and owned large parcels of land. He and his wife were accused of witchcraft and we have no doubt that the goal was to obtain his land. If someone confessed to being a witch, they lost all their property. Giles had sons that he wanted to pass his property onto and he refused to allow the town to take what was rightfully his. He refused to confess, so the judges hauled him out for a little torture tactic they had devised called pressing. You see, if you are a witch, apparently you cannot be crushed to death. Giles was committed to not losing his property and so as the board was placed on his body and the first few stones were placed atop, he called for more weight. As the judges screamed for him to confess, he continued to yell for more weight even as his chest was weighted down. He was nearly dead when his eyes flashed open and he hurled a curse at the judges before he took his last breaths. His death proved he was innocent. And his curse would live on. Three days after Giles death, his wife was hung along with seven other convicted people. These would be the last victims of the witch trials. In all, twenty innocent people lost their lives. Four people died in jail. Even two dogs were executed as witches. Nearly two hundred people had been accused and jailed and many would stay there because the law required that accused people had to foot their own care bills in jail. So if you couldn't pay your debt, you were stuck. Many wallowed in jail for months until family members or others would take pity. Tituba became the servant of another man who paid off her jail bill. In the end, most scholars agree that while mass hysteria could have played a role, it is more than likely that people lied because of long standing property and church disputes. The emotions and horrible deaths of the innocent have tainted Salem. Not only is Salem now synonymous with outrageous hysteria leading to the deaths of innocents, but Salem seems to be victim to curses and hauntings. And the irony is that today, Salem is a mecca for those who practice Wicca and for pagans. Giles Corey's curse was fairly simple. He hollered, "I curse you and Salem." It is said that Giles himself appears as an apparition before anything befalls the town. There was a huge fire in Salem in 1914. Giles appeared before several townspeople before the fire started. One has to wonder how that fire was started. Sarah Good called out a curse on Reverend Nicholas Noyes who was a part of the trials. She said to him, "I am no more a witch than you are a wizard and if you take away my life, God will give you blood to drink." Twenty-five years later, the good reverend had an aneurysm that poured blood down his throat to the point that he choked to death. The John Ward House was used as a place of interrogation during the trials. We visited this during our ghost tour and it's a neat home that reminds us of a large cottage. The house sat across the street from the witch dungeon until it was moved in 1910. Today the house is used as storage for the Peabody Essex Museum. Full bodied apparitions have been seen and photographed in the house. One night, an employee was in the building by herself when she heard the door open and heard footsteps. She called out and got no answer. She investigated and saw nothing. She returned to what she was doing and heard the footsteps again. They seemed to be climbing the stairs towards her. She was afraid that someone had broken in and that she was in danger. She ran terrified from the building and never returned. Sheriff George Corwin was the law during the Salem Witch Trials. He was the one who arrested those nearly 200 accused people. He interrogated the accused and sometimes even participated in the torture they underwent and many claim he enjoyed committing the torture. Corwin died shortly after the hysteria and he was buried in the basement of his home to keep it safe from villagers who would want to tear the body apart. The home was later torn down and the Joshua Ward House was built on the property. That house is claimed to be the most haunted location in Salem. People claim to feel as if some unseen thing is choking them. A woman in black has been seen here and men feel uncomfortable in the house. They are the ones usually attacked and many believe a female victim of the trials is seeking revenge against Corwin at his former home. The Old Witch Gaol is reportedly haunted. Prisoners were starved and given no water. Several people died in prison due to the bad conditions. A building used by the phone company now stands where the Gaol used to be. Employees are reluctant to use the landlines in the building because occasionally the screams of the tortured come through the lines. People claim to have been touched and pushed inside the building. It is believed that one of the spirits belongs to an angry former guard. His full body apparition has been seen. Two beams were found when digging on the new building began. It is believed those beams were part of the dungeon. One is now on display at the Witch Dungeon Museum and employees claim the beam is a haunted artifact. Twice when the beam was photographed, a woman in eighteenth century clothing appeared behind the beam in the photos. Keep in mind that the trials took place during the seventeenth century. Ghost Adventures visited the Witch House in 2011. The building is the former home of Magistrate Jonathan Corwin and stood during the witch trials. The batteries on their equipment kept dying. The investigators believe they captured an EVP of Bridget Bishop because the voice said, "Apple." They also picked up a child humming. Phantom footsteps are heard in the house by visitors and employees. Dark shadows are sometimes seen upstairs. Once when an employee was reading the names of those executed during the trials, a tin sconce flew off the wall. Salem just seems to have a spooky air about it. Is it just because of its notorious past or are the undead very active in this city? Have we learned our lessons from the Salem Witch Trials or will humans continue to find scapegoats and accuse innocent people like we had during the Red Scare and when America relocated and imprisoned Japanese-Americans during World War II? Is Salem haunted not only by its past but by spirits? That is for you to decide! During the Civil War, captured Confederate soldiers were imprisoned on an island off of Boston named George’s Island. One of these soldiers was Andrew Lanier. When his wife found out that he had been taken prisoner, she found out where and she traveled from their home in Georgia north to Hull, Massachusetts. A Confederate sympathizer lived in Hull and he invited her into his home, which was positioned perfectly right off of George’s Island. It was so close, that she could watch through a spyglass what was going on over in the fort and prison. She decided to rescue her husband. She cut her hair off, dressed like a man and carried an axe and a pistol. She rowed through stormy waters across to the fort. She squeezed through the slits of the dungeon and the captured Confederate soldiers dug a tunnel using her axe. They were nearly finished when a guard heard the digging and all the soldiers were pulled from the tunnel, except Mrs. Lanier who remained hidden. She sprang from the tunnel and pulled her pistol. One of the guards knocked the pistol from her hand and when it fell to the ground, it went off sending a fatal bullet into her husband. Mrs. Lanier was sentenced to hang. She asked that she be hung in female clothing, but none could be found. There were only black robes and so she was dressed in a black robe. She was hung and buried on the island. From that time, soldiers would tell tales of seeing a mysterious dark shape on the island and sometimes they even saw a young lady in black. With all our stories of ladies in white, we find a story about a lady in black a little odd…or at least unusual. On this day, August 3rd, in 1900, the Firestone Tire and Rubber Company was founded by Harvey Firestone. Firestone opened the company in Akron, Ohio since several other tire companies were already based there. The company started with 12 employees and initially supplied pneumatic tires to wagons and buggies. With the advent of the automobile, Firestone saw a new opportunity and in 1906, Henry Ford gave Firestone a contract for the company to provide all the tires for his Model T. Firestone became the first tire company to start mass producing tires. The company expanded into Canada in 1918 and by 1926, it had a rubber plantation in West Africa. During World War II, Firestone manufactured artillery shells, rubberized military products and aluminum kegs. Firestone continued to make missiles for the military throughout the 50s and 60s. By the 80s, the company was faltering and going bankrupt. It was bought by Japan’s Bridgestone in 1988 and the Firestone Company thrives today having branched into many divisions and areas including building products and car care. But it all started with one man and 12 employees. Danvers State Hospital sits on land that once was inhabited by Native Americans. Through the years the area was settled by Europeans and became known as the town of Salem. Later, the town of Salem would be broken into smaller towns and the city of Danvers was established. A state hospital was built here that became home to not only the terminally or drastically ill, but also the mentally ill. As is the case with so many hospitals and sanatoriums that we have researched, this was not necessarily a good home for people. Years of abuse and deaths have led what used to be Danvers State Hospital to be considered one of the most haunted places in Massachusetts. Reports of hauntings continue today despite the fact that it has now been converted into apartments. Come with us as we explore the history and hauntings of Danvers State Hospital. The state of Massachusetts was home for many indigenous people. As we discussed in our haunted Plymouth podcast, the Wampanoag and Pokanoket tribes were in Massachusetts long before the pilgrims and explorers came. There were also the Naumkeag and other Pequot speaking tribes that specifically lived in what would become the city of Danvers. The city of Salem was incorporated in 1629, which we will cover more in depth in our next podcast on the Salem Witch Trials, and between the towns of Salem and Boston, an old Naumkeag trail existed. The English colonists formed this trail into a road known as Ipswich Road in 1630. The city of Salem expanded and this settlement was named Salem Village in 1636. Salem Village would have a strong connection to the Salem Witch Trials. One such connection is the homestead of Rebecca Nurse. You may remember that we mentioned her in a previous This Day in History as a woman who was hung with four other women on Gallows Hill. The people of Salem Village petitioned the King for a charter, but in typical King fashion, he was a jerk and refused. The villagers decided to rename their town Danvers after an early settler named Danvers Osborn in 1752 and by 1757, the residents decided to ignore the fact the crown would give them no charter and Danvers was incorporated on June 9th. The town grew slowly, but it was not until 1847 that the railroad would arrive, bringing with it more opportunity. A town hall was built in 1855 that is still used today and the southern portion of the city broke off and incorporated as the city of Peabody. In 1884 a railway was built in the street to accommodate horse drawn trolleys of which the town had 69. As technology progressed, the railway was converted to electricity. Francis Dodge owned a farm up on a hill in Danvers. The hill was known as Hathorne Hill and was a 257 foot high glacial drumlin. The hill was named for Jonathan Hathorne who was a Salem trial judge and also an ancestor to Nathaniel Hawthorne, who changed his name to distance himself from his ancestor. Hathorne had lived in a home on the property. Massachusetts had a growing population of mentally ill people and they needed more room to house them. They decided they needed another psychiatric facility and Hathorne Hill seemed like the perfect place. After much persuading, which we assume came through the use of a lot of money, Francis Dodge was convinced to sell his farmland. Construction began on the hospital and consisted of two main center buildings. The main building housed the administration and had four wings that branched off from it. The wings were separated into male and female wings and the most extremely affected patients were placed in the outermost wards. The other building was connected to the main building and housed the laundries, kitchens, a chapel and dormitories for employees. Red brick was used in the construction of the walls and gray slate was used for the roofs. 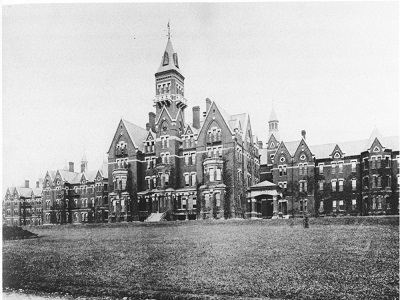 The Danvers State Hospital officially opened in 1878 and cost $1.5 million to build. The main building came to be known as the Kirkbride and in subsequent years, other buildings were added. Solariums were added to the wards and a gymnasium was built. As buildings were added, so were tunnels. As we have come to find, tunnels were a typical feature of these hospitals to make it easier to transport people and things. One of the tunnels ran from a steam and power generating plant to help the hospital be self-sufficient. Water came from the nearby Middleton Pond. The tunnels spoked out from the main building and so they were called the Wagon Wheel. The hospital was originally designed to house 500 patients. The attic was opened up to make room for 100 more people. This would still not prove to be enough space and some patients were relegated to the basement. By the 1930s, over 2,000 people called Danvers State Hospital home, so one can imagine that overcrowding was extreme. And overcrowding leads to less care because there is not only not enough space, but enough staff. Nine people would have to manage 2,000 people on one shift. When the hospital was first opened, mechanical restraints were used on patients. Dr. Charles Page became superintendent in the 1890s and he decided that the restraints were inhumane and he banned them being used. But don’t let that act fool you into thinking that this hospital for the mentally ill would be better than the others. The same practices we consider barbaric today that were used at other insane asylums were used at Danvers State. These included straitjackets, hot and ice cold baths, shock therapy and lobotomies. Later, drugs were used to keep the patients in almost catatonic states. By the 1960s, deinstitutionalization was spreading and Danvers State was under scrutiny for some of its practices. Portions of the hospital were shut down. Massive budget cuts started as well and the patient population decreased drastically. By 1985, most of the hospital was closed or abandoned. In 1989, the Kirkbride Administration Building closed and the remaining patients were moved to the medical building across the campus. In 1992, the entire campus closed for good. The property underwent renovations in 2007 to turn it into apartments, but a fire broke out and damaged much of the construction. The Kirkbride was demolished after that.The outer shell is all that is left along with the cemetery and tunnels. As of June 2014 it has been in the hands of another company and apartments are to continue being built. The entire hospital found itself gaining several nicknames in the 115 years that it was open. Some referred to it as the Palace on the Hill, while others called it the Castle on the Hill. The name that interests us the most is the Haunted Castle. And there are many stories of hauntings at Danvers State Hospital. These hauntings are not only attributed to the harsh treatment that patients endured, but because of the close proximity of the Salem Witch Trials and the stories of curses surrounding those events. Several patients were buried on the property. During the years that this was an abandoned property, homeless people used it and curious people came to do urban exploring or some came to investigate stories of hauntings. While trespassers were arrested, there were tours offered to a maximum of groups of 20 twice a month. The movie “Session 9” was filmed on the property as well. All of these could in some ways attribute to the stories of hauntings, whether imagined or real. Jeralyn Levasseur’s father, Gerald Richards, was a hospital administrator and so she lived on the property in a home that was lent to them. The second story hallway played host to disembodied footsteps often and the lights would flicker on and off. Doors would open and close on their own. One day, Jeralyn’s brother and sister decided to play in the attic. Their fun came to an abrupt end when they noticed a woman scowling at them from a corner of the attic. They did not know the woman and they could tell that she was not solid. They were terrified and huddled in an opposite corner until their mother called for them to come down from the attic. Later, Jeralyn would experience this same apparition. She was sleeping in her room when she was awakened by the pulling down of her bed sheets. When she opened her eyes, she saw an angry older woman scowling at her. Although the woman was scowling, Jeralyn did not feel threatened and the apparition disappeared. Finding out about the hauntings at Danvers is tough as staff early on kept such stories quiet and later, the police would tamp down tales of paranormal experiences. When it was decided that the property would be developed into housing, one can imagine that haunted historical information would be hidden. But many paranormal investigators visited the property over the years and they collected evidence of supernatural activity. Dark shadows were witnessed and caught on film. Phantom footsteps were heared and captured on EVPs. One investigator had visited the property many times as a teen to hang out and drink alcohol. He claimed that there was a dark energy to the building and he imagined that the energy from the emotions of the former residents was trapped in the brick walls. A couple of Wiccans visited the property in the past and they claimed to feel an intense foreboding. Psychics claim to feel pain and confusion from unseen entities. And there are those that claim that the energy could cause something referred to as a personal haunt. This is a phenomenon we have not covered before. Parapsychologists claim that people can sometimes have their own fears and doubts manifested by darker energies in a place. Basically, the agony caused to others in the past could cause your own pain to erupt and possibly who will either have intense negative feelings of foreboding or see something that may not actually be there. A kind of figment of your imagination. With a history for not only the buildings of Danvers State Hospital, but also a history for the land, it is not surprising that at least superstition has a stronghold on the property. Do the souls of former patients roam the area? Is the ground cursed? Is the area of the former Danvers State Hospital haunted? That is for you to decide!